It is possible to get too much of a good thing and occasionally runners will find the old training routines and races that once thrilled them are starting to lose their sparkle. If it’s no longer fun, running can quickly become a grind, but there are plenty of ways to keep running interesting and stay motivated. Try to set targets. It might be to enter your first race, run a marathon, record a personal best for a 10K or complete a triathlon. Training runs can be more structured and take on a new purpose if they are geared towards a particular target and a runner can get a huge sense of achievement by realising a long-term goal. It can be difficult to stay focused if the next big race is a long time off, but setting mileage targets can keep runners motivated during training runs. Try to cover a particular distance over the course of a week or month, but be flexible about how and when you clock up these miles. A change of gear can give a runner a new lease of life. Proper footwear is essential, so get a specialist running shop to analyse your gait and don’t skimp when choosing the right trainers for your running style. Technical running clothes are not as essential, but can make training runs a lot more comfortable. Fabrics that work to cool runners when it’s hot, insulate them when it’s cold and shield them when it’s raining, allow the athlete to concentrate on what’s important – the running. Runners who have always gone it alone can find extra motivation by joining a club should their interest start to wane. Clubs will often offer members quality coaching and a runner is sure to find plenty of like-minded people to inspire him. Those who are already members of a club can stay motivated by becoming more involved, perhaps by helping to organise club races or acting as a marshal. 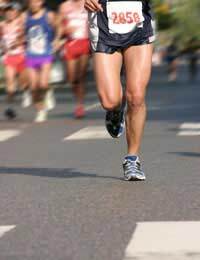 If there are any newcomers at the club, an experienced runner may consider taking a novice under their wing. Passing on advice and seeing a novice runner progress can give an established runner a boost. Both coach and pupil can get a real sense of achievement as goals are reached. Get back to basics with nutrition, ensuring that you get the right mix of protein, carbohydrates and good fats, to give yourself an energy boost. A new, leaner, meaner runner will emerge, but remember too that there is still room for the odd treat. Be good to yourself, with rewards for a good month of training, breaking a personal best or completing preparations for a big race. That might mean a meal at a nice restaurant, trip to the theatre or a new DVD – whatever makes you happy. Equally, don’t be too hard on yourself when things don’t go to plan and don’t push too hard. If your body is telling you it’s too tired to run, heed the warning, take a break and come back refreshed when ready to start again. Sometimes a simple reminder of all that’s good about running – the fact that it keeps you happy, fit and trim, relieves stress and gives a huge sense of satisfaction when feats of endurance and speed are achieved – is all the motivation a runner needs.